Whether you’re looking for lodgings in Big Bear, planning a Big Bear vacation, or want to stay on or near Big Bear Lake, our cozy Big Bear cabin rentals and hotel in Big Bear Lake are sure to delight. 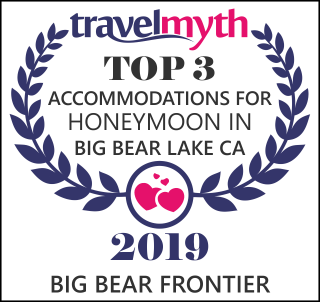 Come see for yourself why Big Bear, California is a favorite vacation destination. Nestled among the giant pines, our comfortably shaded resort stretches from Big Bear Boulevard to the water’s edge of the lake. Our guests enjoy sandy beaches, grassy knolls, and the soothing sounds of a natural stream that flows through the Big Bear Frontier into Big Bear Lake. Before you travel, be sure to check the Highway 18, 38 and 330 road conditions. There's a lot of fun for you and your family to be had here at Big Bear Lake. Make the most of it and stay with us at Big Bear Frontier Cabins and Hotel where you'll find the accommodations and hospitality to be above the rest.